Wall mountable vending machine dispenses LifeStyles brand condoms. Double column configurations with 50 cent or 75 cent vend. Convenient, discreet and low maintenance. 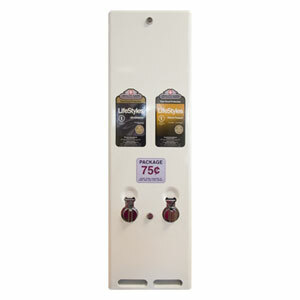 Double column vending machine is free with the purchase of 792 condoms (11 boxes x 72/bx) plus freight. See VD-A-2-0498 for single column. Note: Due to the wide variety of wall types these on which customers mount these vending machines, mounting screws are not included in the box.